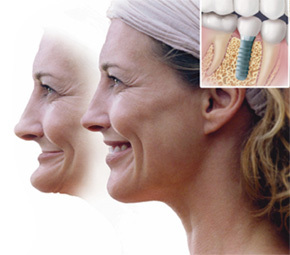 • Wearing dentures accelerates bone loss, and old dentures become loose because of resulting bone loss. It is possible to watch and wait for bone to disappear to the point where treatment success of any kind is doubtful. • At the end of a five-year period, only 40% are still wearing the original partial denture made for them. This is not a great testimonial to value and utility. Those lucky enough to have a functioning partial denture after 5 years are still losing valuable supporting bone. • Patients with natural teeth can bite with about 200 pounds of force. Denture wearers can bite with approximately 50 pounds of force. Those wearing dentures for 15 years or more can bite with only about 6 pounds of force, and their diet and eating habits have had to be modified accordingly. For bone maintenance, the health of adjacent teeth, the longevity of the restoration and patient comfort, implant therapy is the treatment of choice. Implants can restore chewing function to the equivalent of someone with natural teeth. If you have questions or want to know if you are a good candidate for implant tooth replacement therapy, please call my new office in Sandy Springs. When you begin to notice these signs call and see your dentist. Whether your gum disease is stopped, slowed, or gets worse depends a great deal on how well you care for your teeth and gums every day, from this point forward. When considering any extensive dental or medical treatment options, you should think about getting second opinion. If we can be of assistance, please call for a free consultation. Dunwoody Dentist: What are periodontal diseases? Periodontal diseases are bacterial gum infections that destroy the gums and supporting bone that hold your teeth in your mouth. The disease which can be caused by multiple factors can affect one tooth or many teeth. The main cause is bacterial plaque, a sticky, whitish film that constantly forms on your teeth. If it is not removed, it can turn into a hard substance called calculus or tartar in less than 48 hours. Tartar is so hard it can only be removed by an oral health professional, such as a dentist or dental hygienist. The bacteria in plaque infect the gums, and release poisons that cause redness and inflammation around your teeth. The inflammation and poisons cause the destruction of the tissues that support your teeth. Once this happens, the gums separate from the teeth, forming pockets that fill with even more plaque causing even deeper and more infection. The disease is multi-factorial. Meaning, there is not just one cause of periodontal diseases but rather multiple factors that can affect the oral health of your gums. ● SYSTEMIC DISEASES that interfere with the body’s immune system may adversely affect the condition of the gums and supporting bone. ● POOR NUTRITION can make it difficult for the body’s immune system to fight off infection. ● GENETICS and family history of periodontal diseases suggest a propensity for developing these diseases. ● TOBACCO use significantly increases the risk of developing periodontal diseases and can thwart treatment. ● HORMONAL CHANGES in women during pregnancy, puberty and menopause can cause the gums to become inflamed and bleed easily. ● POOR ORAL HYGIENE technique, oral piercing, drug or alcohol abuse can affect periodontal health. ● STRESS can make it more difficult for the body to fight off infection, including periodontal diseases. ● Some MEDICATIONS such as oral contraceptives, antidepressants and certain heart medicine can affect oral health. Dr. Orland trained in the prevention, diagnosis and treatment of periodontal diseases, and oral inflammation. In addition, Dr. Orland is trained in the diagnosis and treatment of oral pathology. On the north side of Atlanta, Dr. Orland works in conjunction with Right Smile Center’s prosthodontist Dr. Novy Scheinfeld to provide you with the finest of care in a practice serving 4 decades of patients. Dr. Orland has a reputation of making your visits calm and soothing. The entire team is dedicated to providing you with the personalized, gentle care that you deserve. If you are in need of a complimentary consult to determine your oral health situation please feel free to contact us. Dentist East Cobb: How much does having a tooth pulled cost? The cost of a simple tooth extraction can range anywhere from $95 to $250 depending on whether the procedure is being performed by a dentist or a specialist. If the tooth is broken at the gum line, it will be considered a ‘surgical extraction’ and usually costs $150 to $300. Extracting a wisdom tooth, usually done by an oral surgeon, can cost anywhere between $150 and $350, but if it’s a partially or completely impacted wisdom tooth then the cost could climb as high as $650. The cost of the tooth extraction can be higher; for example, if the tooth disintegrates, it can take the dentist a while to get all of it out and the dentist may charge you extra if that happens. Each patient and each tooth is unique. It can be cookie cutter, but it doesn’t have to be. 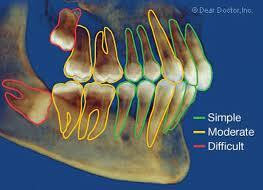 The bottom line is the harder the tooth is to get out, the more it costs, hence the range of cost. For a soft tissue surgical extraction of a partially impacted tooth, an incision usually has to be made into the gums and once again the cost will increase to about $200 -$350; and for a partial bony extraction (the tooth has some bone covering it) expect to pay anywhere from $300 -$600. The above fees often include a follow-up office visit to check healing or to remove sutures. What should also be included is the understanding that a tooth is firmly encased in a bony socket and attached by a ligament. The socket needs to be gently widened to allow the tooth to be removed; patients will feel pressure but not pain during this procedure. Sometimes a tooth is so firmly anchored that is has to be removed in sections. Additional related fees, particularly an oral surgeon may include an initial surgical consultation ($50 – $135), x-rays ($13 – $135) and sedation ($200 – $400 or more) if required. Many dental insurance plans cover 70 percent to 80 percent of tooth extraction costs if the procedure is considered to be medically necessary and not done just for cosmetic reasons. Since 2012 we offer extractions in-house. This is convenient and usually costs less because there are no additional consultation fees or x-rays. Typically, dental insurance permits only about $1,000 per year coverage so if there are other teeth needing to be extracted then the cost can escalate above the annual limit. Because of the limited coverage that dental insurance provides, most people have come to realize that they don’t have much protection from the high cost of dental care with dental insurance alone. Our goal is to help you understand a procedure which may vary depending on the circumstances surrounding the tooth being pulled. If you have additional questions or concerns, do not hesitate to contact our office or email us. We offer comprehensive restorative and cosmetic care coupled with modern technology. The right smile is a collaborative effort of your input and our expertise. When the need arises we provide you with a multi-specialty group practice, with root canals, implant placement, teeth whitening, periodontics and cosmetic makeovers all under one roof. Quite often many dental procedures require multiple disciplines and techniques. Not only do we provide all of these services through our multi-specialty group, we also provide many in-house dental lab services. All of this saves you time and money. You’re more than a patient to us; you’re an individual with unique concerns and needs. And you’re the reason we are here. Our team is dedicated to taking the time to learn about you and your needs, and then and only then develop a practical treatment plan to create the right smile. You are concerned about the quality of your dental care. You need a dentist who can restore optimal appearance and function to your smile. You need a dentist with advanced training in esthetic restoration and replacement of teeth. Since the early 2000’s, adults have been visiting the dentist less. And the Great Recession has only aggravated the trend. We see it in our practice and know it is happening in our competitors’ practices as well. The assumption is that the patient is saving money by extending the time between regular visits or by not going at all. Not only is this assumption is wrong, but it costs patients their health as well as more money. Patients who see their dentist on a regular basis save money in adjunctive health treatment. New research by United Concordia shows that patients who visit their dentist on a regular basis not only improve their overall global health but by extension save in reduced medical costs as well.